Waterville was founded in 1867 as the western end of the Atchison & Pike’s Peak Railroad. Cowboys on the Chisholm Trail drove cattle to the railroad terminus. Though it began as a rough cow town, Waterville is known today for its many Victorian homes and its community support for performances in the Opera House, restoration of the Weaver Hotel, and preservation of the Central Branch railroad track. 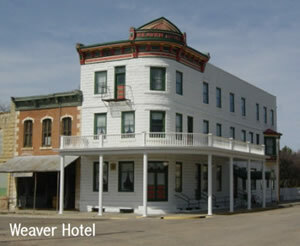 Weaver Hotel (1905). National Register of Historic Places. Restored and re-opened as a hotel and tourism center, with meeting rooms and a gift shop, Fancy T’s & More. Opera House (1903). Restored and in frequent use for community gatherings and performances. Named to the National Register of Historic Places in 2008. Depot Museum. The depot was moved to an in-town location and is now a museum of Waterville memorabilia and railroad collections. Caboose Museum. This 1925 wooden caboose has been renovated into a railroad museum. Samuel Powell house. Queen Anne style, restored in 1990’s. National Register of Historic Places. Local contact: Ward Alan Minge, 785-363-2498. 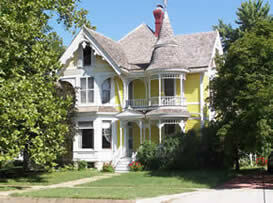 Waterville also has many other fine Victorian homes which can be viewed on a driving tour around town. Game Fork School. Rural school, closed in 1952 and later moved to northwest corner of the Waterville City Park. Now a designated Scouthouse headquarters. “Banker’s row”. 200 block East Hazelwood. Three beautiful Victorian homes built by early-day bankers. Drive by only. Keefover/Mount Pleasant School and cemetery. In 1893 a woman who had died after the birth of her eighth child was buried here where her older children attended school. The grave is in the northwest part of the schoolyard and is marked by rocks. Private property. On Sunflower Road 1/2 mile west of 2nd Road.